The leaves have fallen and the gourds are out which means the holidays are on their way. And we all know what that means. It’s time to start thinking about holiday decor. Today we’re creating holiday stockings that you can easily hang over the fireplace with handy dandy VELCRO® Brand Holiday Decor Wraps. 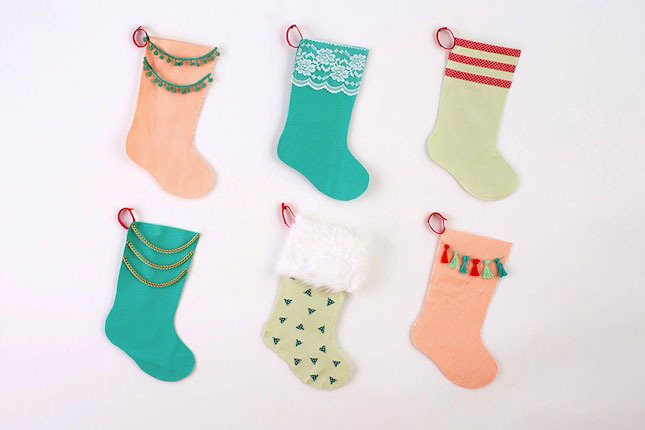 Follow along to check out six charming ways to embellish your stockings! 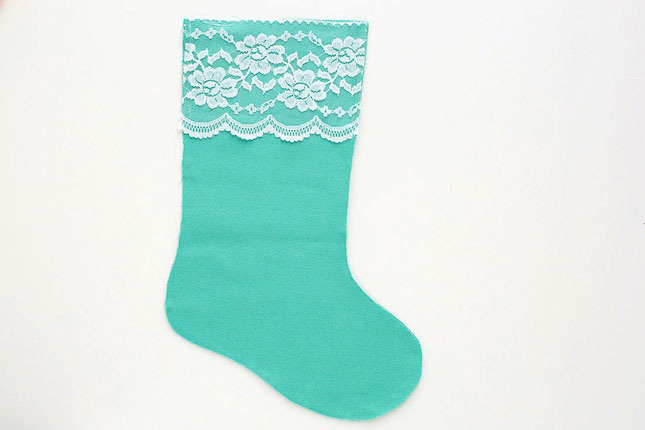 First create a basic stocking. 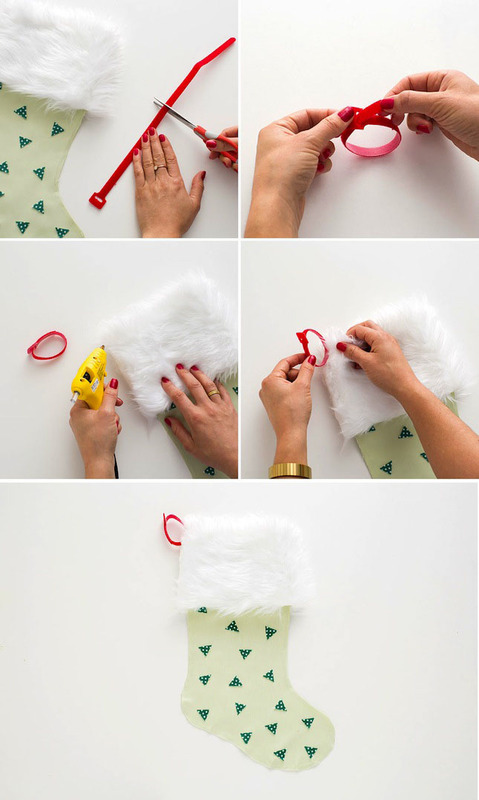 Take your stocking template, and cut it out. Then fold your fabric in half so that you have two layers. Trace your template on the top layer. You can pin the pieces together if it helps. 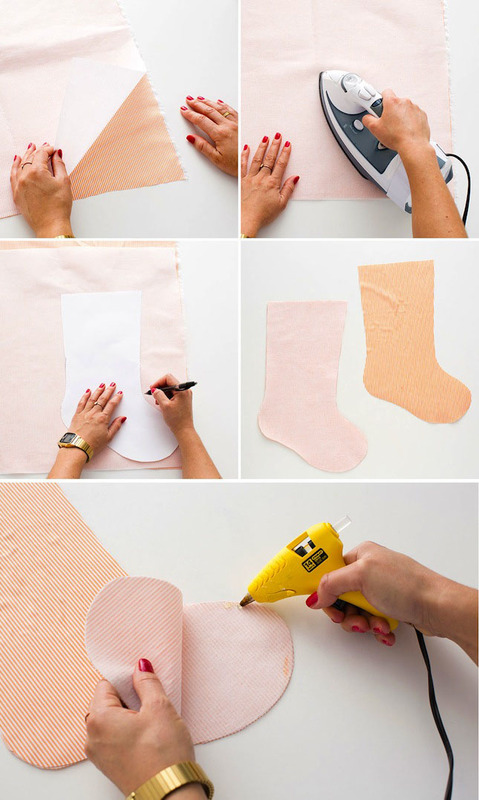 Cut out your stockings and then glue them together. If your fabric is thin, add iron-on interfacing to stiffen your stocking. 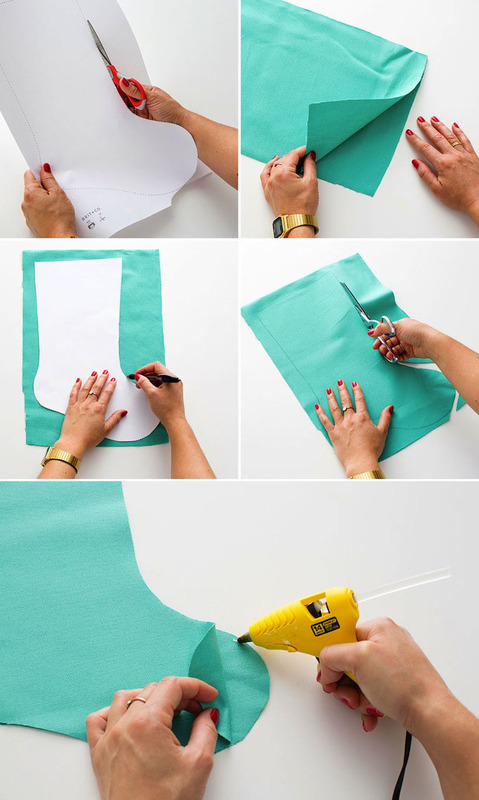 First place your iron-on interfacing on the back side of your fabric with the glossy side down. Adhere it by pressing firmly with your iron, being careful not to leave your iron in one place for too long. 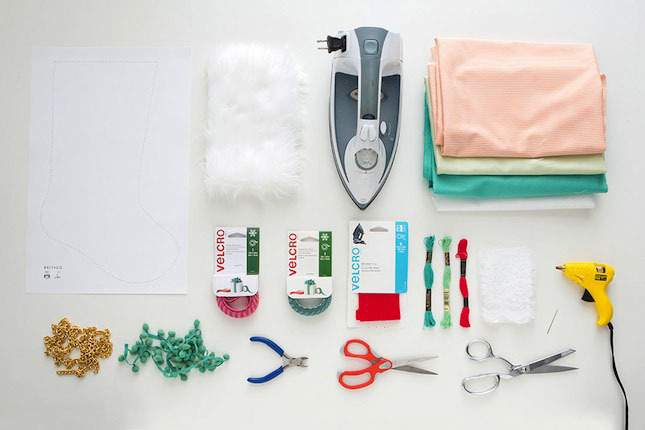 Once the iron-on interfacing is attached to the fabric, follow the steps above to create your stocking. 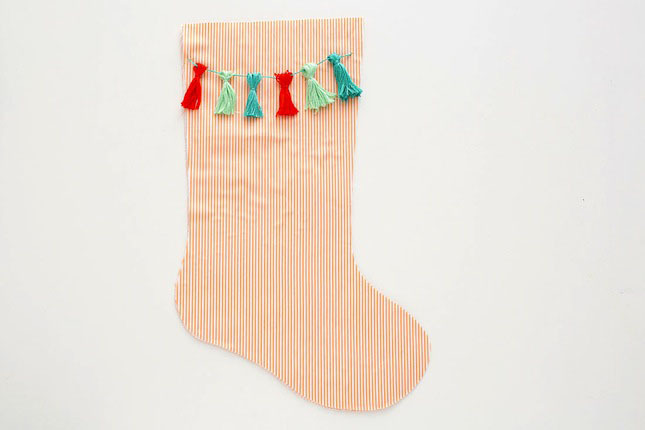 Now it’s time to add embellishments to your stockings. We went with six different options. 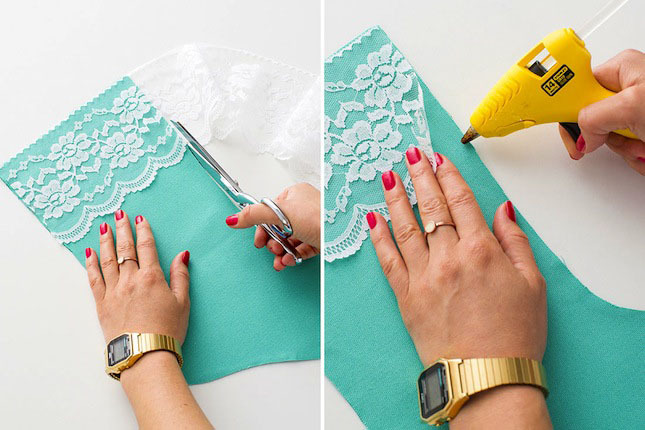 Place the lace on top of the stocking and cut a piece to size. Use hot glue to attach it. We just love the polka-dotted VELCRO® Brand Holiday Decor Wrap! 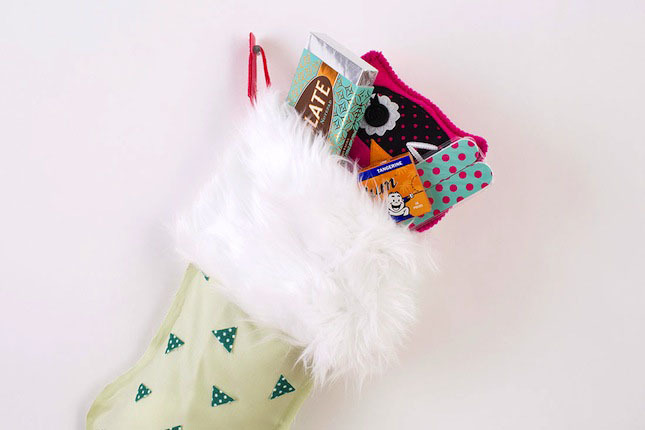 For this stocking we’re using it for design purposes. 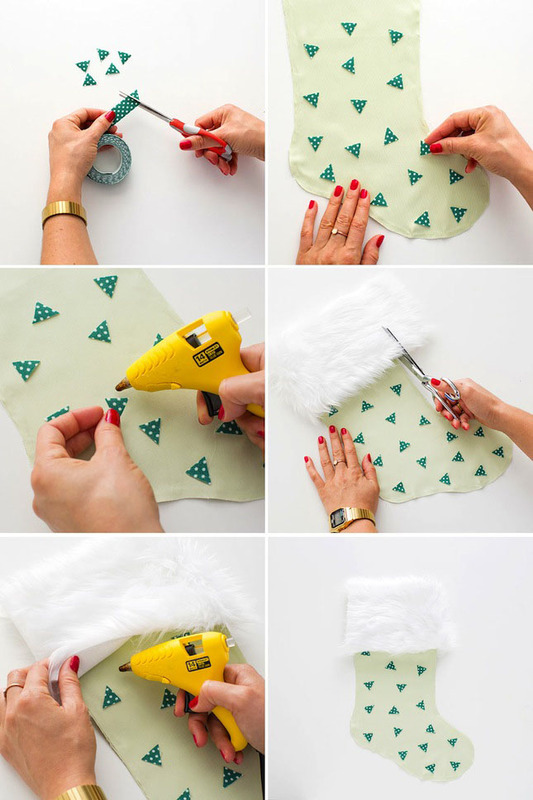 Cut out small triangles and then glue them to your stocking. Cut out a piece of fur to add to the top and glue it in place. Get your embroidery floss, and wrap it around two fingers. Keep going until you have a nice thick loop. Cut a piece of embroidery floss about three inches long. 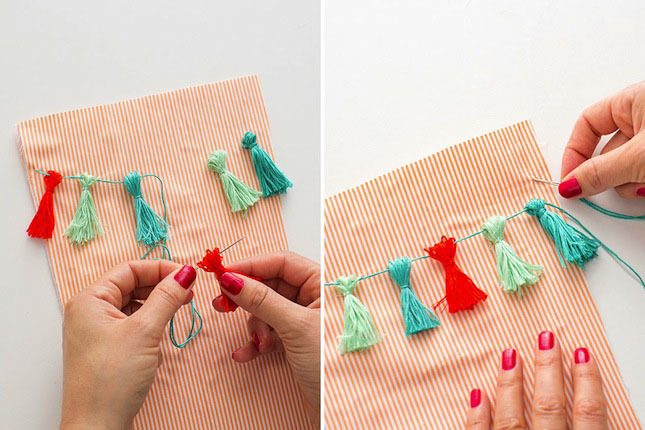 Wrap it around one end of the tassel and tie it in two knots. Cut through the loops at the other end of the tassel. Now make a bunch of these suckers. 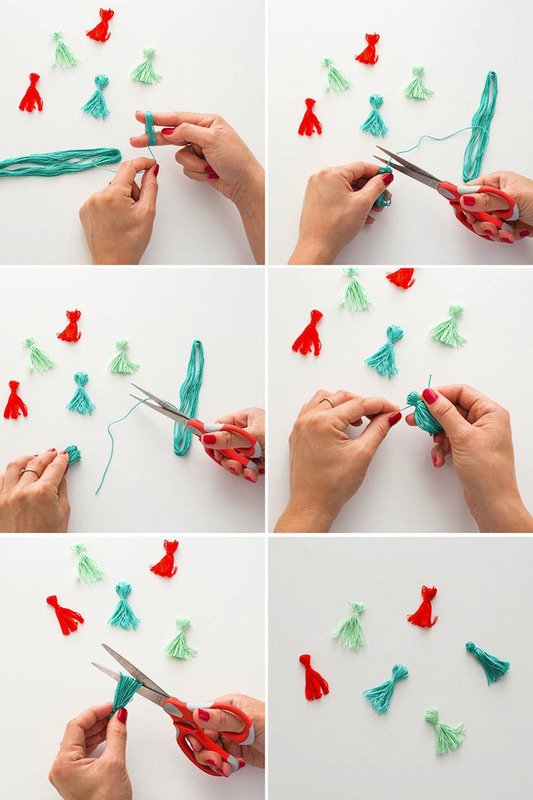 To add them to your stocking, thread the tassels onto a piece of embroidery floss and then stitch it onto the stocking. We simply tied a knot on the inside of the stocking to keep it clean. 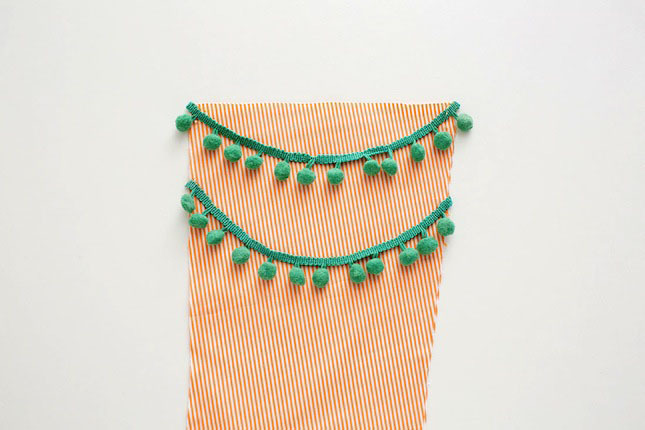 Little pom pom garlands will do the trick for our next stocking addition. 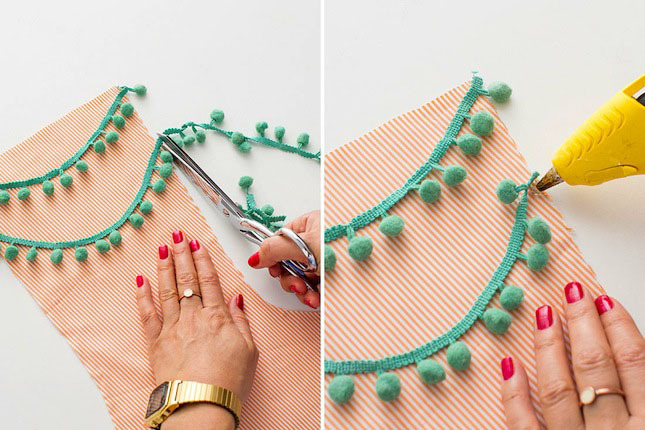 All you need to do is cut your pom poms at the length you desire and glue them in place. Easy peasy. We couldn’t get enough of the polka-dotted VELCRO® Brand Holiday Decor Wrap so we’re doing another design using this versatile material. 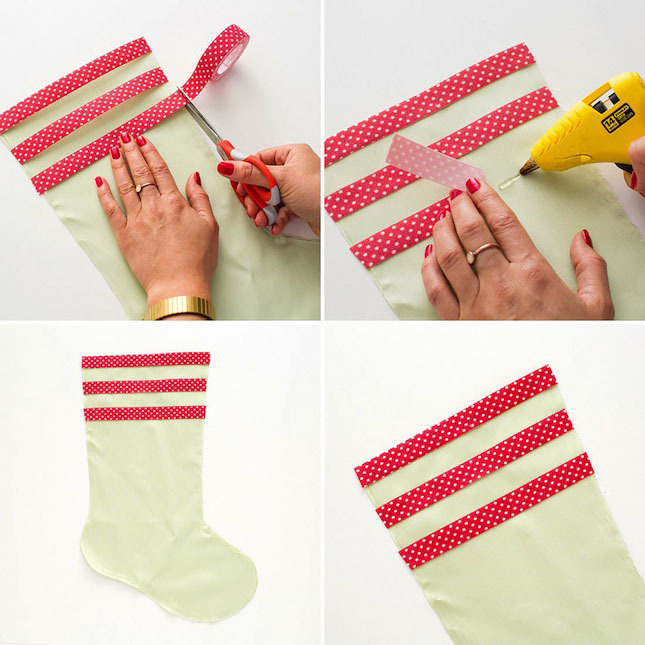 Cut stripes and then glue them to your stocking. So cute! We had to add a little bit of gold bling to one of our stockings so we went with gold chain. 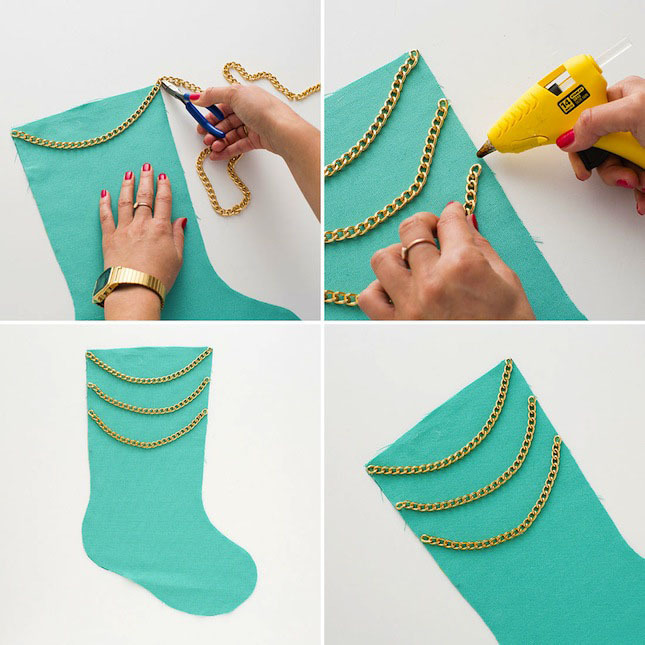 Measure and snip your gold chain and then glue each strand to your stocking. Done and done. 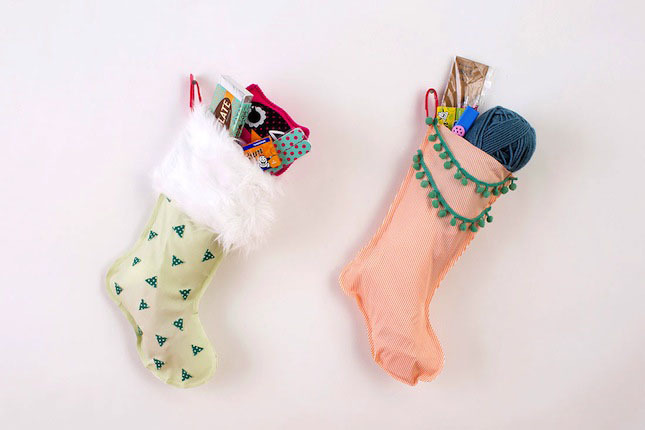 Now that you’ve created your stockings, it’s time to add your hooks. Grab your VELCRO® Brand ONE-WRAP Ties and trim them to size. Glue them to the sides of your stockings. Now it’s time to stuff these cuties.